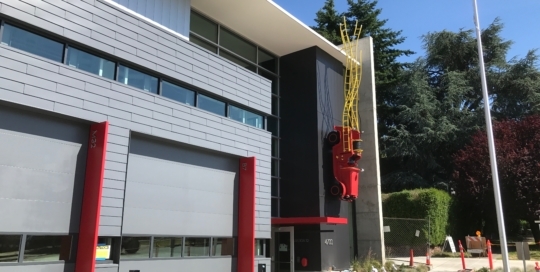 Engineered Artworks created a large-scale fabricated steel version of a wooden toy fire truck for Fire Station 32. Inspired by historic fire trucks of the late 1920s and 1930s, “Engine 32 ½” has been modeled after the original Engine 32 that Captain Steve Sanislo operated out of this station for many years… a 1924 Seagrave Apparatus. “Engine 32 ½” is a custom designed and fabricated idealized version of a real vintage fire truck built to ½ scale with a toy-makers detailed aesthetic… endowing it with a sense of play, whimsy and imagination. The ladders of “Engine 32 ½” extend, stretch and come alive behind the apparatus, organically and impossibly creeping across the outer wall of the firehouse. The extension of the ladders behind the truck represents the speed and urgency of the Fire Fighter’s mission. The overall shape of the ladders emulate a chaotic abstract flame. Fire is one of the most important elements to man and a catalyst for many aspects of creation, and it is also one of nature’s most destructive forces. 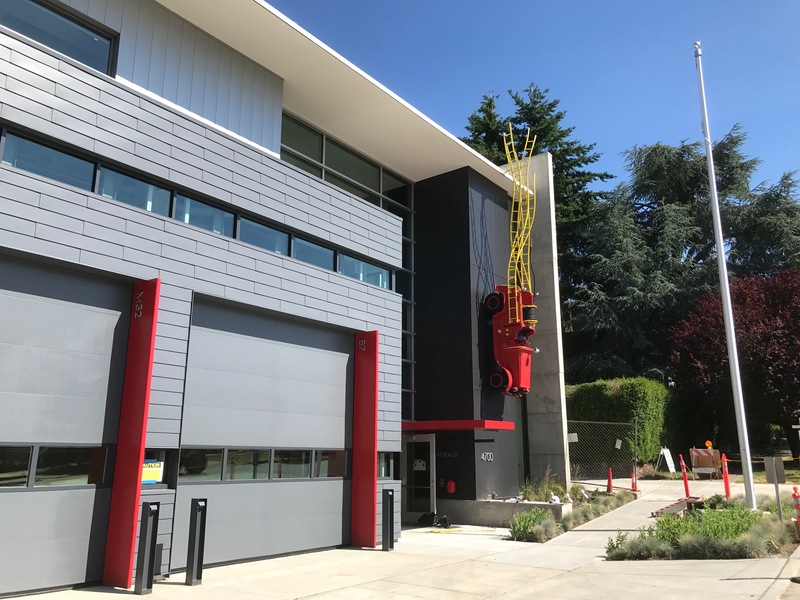 Designed to inspire and reflect the surrounding community, this piece acts as a nod to West Seattle fire fighters of the past, and an inspiration to the future fire fighters of tomorrow. The location I have chosen is highly visible to the surrounding community and acts as an intriguing point of interest that will draw people in from Alaska Street as they walk or drive past the station. The headlights of the truck are fully operational, lighting the main entrance-way for nighttime visits to the Fire House. 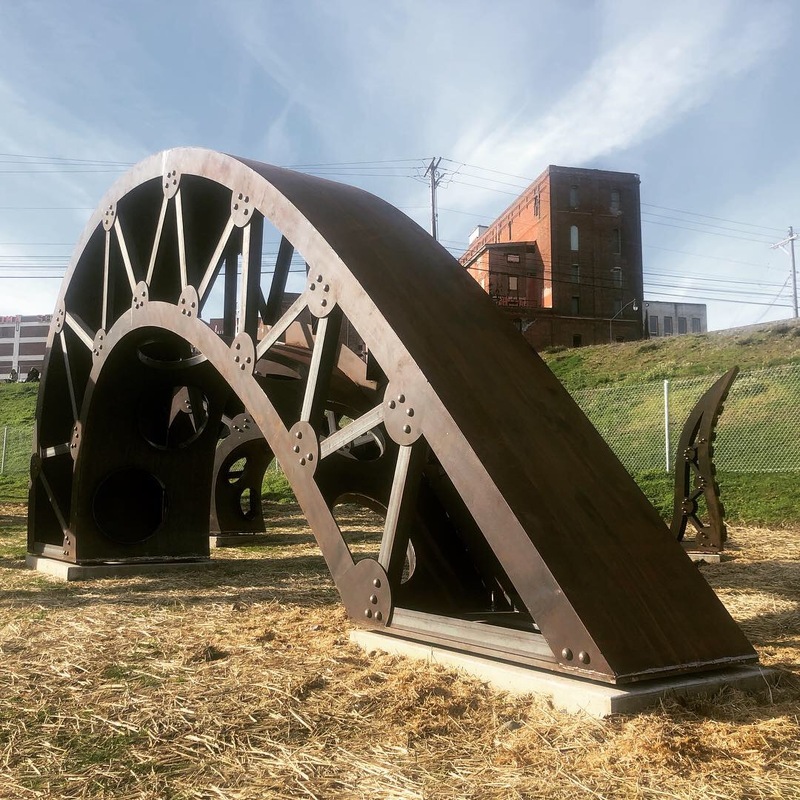 “Gerties Ghost” is made up of 8 large-scale arch segments, in a style evocative of classic railroad truss bridges, and which by its very nature is suggestive of connection between the here and now; past into future. Approaching from any of the surrounding neighborhoods by train, by car or on foot, visitors will see in the arches a familiar reflection of the Tacoma Dome, a nod to the classic lines of downtown’s Union Station and an aesthetic homage to the classic industrial trussed bridge. While we don’t condone octopus wrestling, we were inspired by the stories that we uncovered surrounding Tacoma’s faceted past. The overall design of “Gertie’s Ghost” is inspired by the mythical 600 pound octopus that theoretically lives in the submerged ruins of the Tacoma Narrows bridge. Eight Octopus tentacles rise out of the ground; an abstract representation of the “Ghost of Galloping Gertie” climbing straight out of the City’s historical roots and into the future. 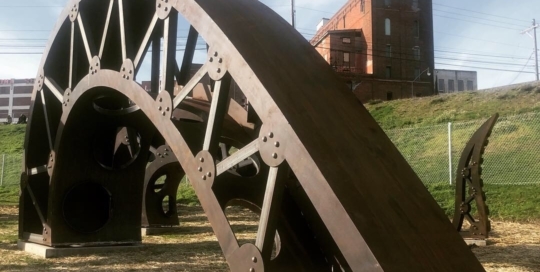 Fabricated of heavy Corten steel, angle iron, plate and rivets, and solidly anchored in concrete, “Gerties Ghost” is built on a scale commensurate with Tacoma’s industrial past and in keeping with the surrounding landscape. Sound Transit’s Public Art Program (STart) has selected Engineered Artworks to create a site-responsive gateway artwork for a new entry to downtown Tacoma, Washington near Sound Transit’s Pacific Avenue Underpass, which is part of its renovated commuter rail extension. This call was managed by the City of Tacoma’s Arts Program.